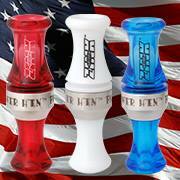 We carry a broad line of duck and goose calls in Wood, Acrylic, and Polycarbonate. Many colors are available. We carry single reed and double reed duck calls geared for the beginner thru expert callers. We have a great line of goose calls including Honker calls, Lesser Canada Calls, Cackler Calls, Specklebelly, and Snow Goose Calls. We also have instructional DVD's and Call Lanyards to help you organize your gear.